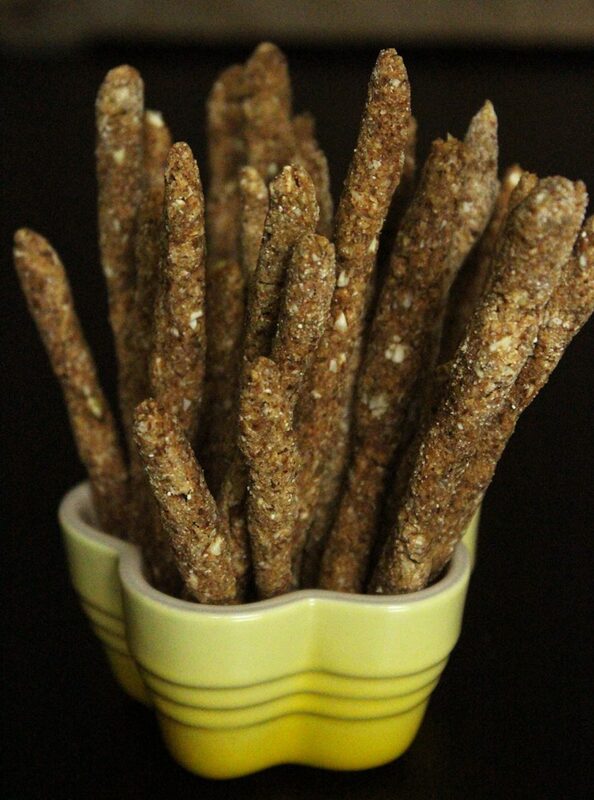 Crunchy sprouted raw vegan pretzel sticks, perfect for dipping in nacho cashew cheese! 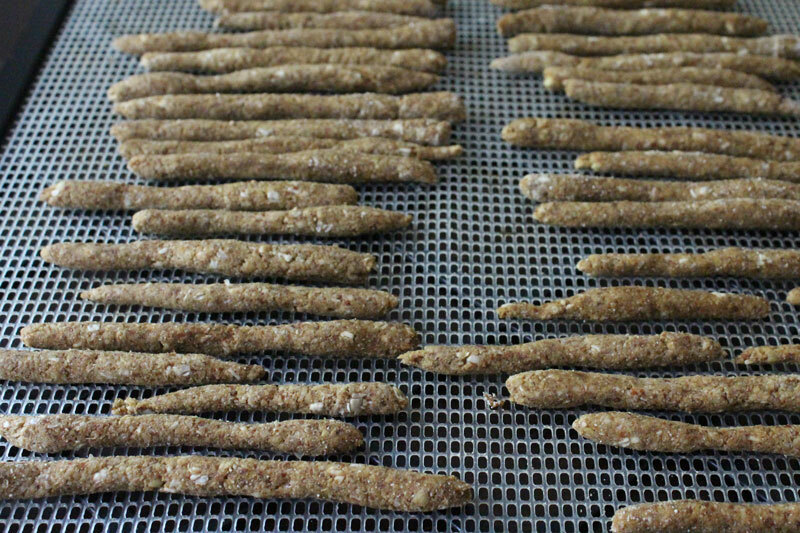 These pretzel sticks are made from sprouted buckwheat, flax seed, almonds, coconut flour, sea salt and coconut nectar; and then dehydrated until crunchy. If you are allergic to nuts, you can use all coconut flour, or sunflower seed, pumpkin seeds or any other seed you prefer instead of almonds. Sprouted buckwheat is my grain of choice for any kind of dough or pastry. When soaked and dried again it gets super crunchy. It is also gluten free despite the wheat in it’s name. You do;t even have to sprout the buckwheat, you can just soak it for a few hours and use it right away. Despite it’s long dehydration time the recipe is very simple. You just mix all the ingredients together and shape your sticks. If you don’t have a dehydrator and choose to use an oven at it’s lowest temperature, it will get crunchy even quicker. You could certainly stop drying so the insides are still soft. 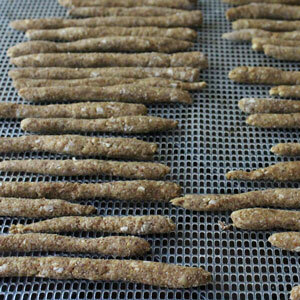 I thought about making a batch with slightly larger sticks and dipping them in cinnamon sugar. Soft cinnamon sugar sticks, Yum! I know what I’m doing next week! To add extras, mix flaxseed with water and soak until you see “the gel”. Flax seed gel will help you attach your flavors, wether it’s plain sea salt, sesame seeds, or cinnamon coconut sugar. I didn’t use anything this time because they are really good plain, or dipped in a sauce of your choice! A crunchy pretzel stick, perfect for dipping. Soak buckwheat groats for a few hours. Either ruse them after rinsing once, or continue to rinse until they sprout little tails in about 1-2 days. 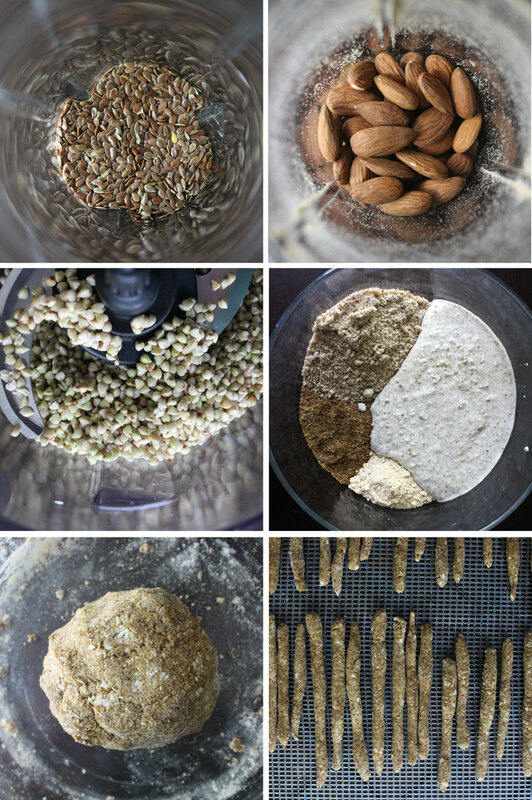 Grind almonds and flax seed into flour. Blend buckwheat with water until it forms a paste. Mix everything together in a mixing bowl until it forms a big dough ball. Add more coconut flour if the dough is too sticky. Take a little piece of dough at a time, roll into a ball, then roll it in-between your hands into long sticks. Dehydrate at 115 degrees for about 24 hours or until crispy. Mix 1/4 cup of water with 1 tbsp flax seed and let it soak until it gels. Brush the gel onto the pretzels and sprinkle on either sea salt, sesames seeds, or cinnamon/coconut sugar. You can make soft pretzels by not dehydrating as long, about 2-4 hours, only the outsides will be crispy and the insides will be soft. Hey Joey, thanks for stopping by and leaving a comment. I’m so glad you like them!